Toronto, July 21, 2015 – As the Co-chair of the Canadian Coalition on Climate Change & Development (C4D) with CARE Canada, Canadian Feed The Children (CFTC) led the Climate Smart Agriculture Learning Conference on July 21st in Ottawa with the support of fellow C4D members. C4D Learning Conference, July 21 2015. C4D is a coalition of international development and environmental organizations working together to share knowledge and take concerted action to address climate change. As the lead on C4D’s knowledge management, capacity development and policy discussions, CFTC designed the conference to help create a space for shared learning on climate-smart agriculture (CSA) and its impact on food security. 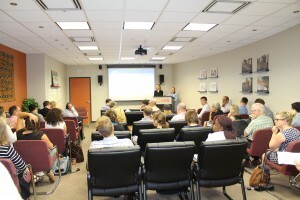 Forty-five participants from C4D member agencies, government departments, academic institutions and the Assembly of First Nations attended the learning conference at CARE Canada’s office. Representatives from the Department of Foreign Affairs, Trade and Development (DFATD), Government of Canada, the International Development Research Centre (IDRC), the Canadian Federation of Agriculture (CFA), academic institutions, and key NGO partners helped to facilitate the panels and discussions. Panelists (left to right) Dr. Barry Smit, Dr. Nalan Yuksel, and Dr. Marco Rondon. Dr. Nalan Yuksel, Deputy Director, DFATD, spoke of the department’s ongoing role in supporting CSA projects as part of an afternoon panel discussion alongside Dr. Barry Smit, University of Guelph and Dr. Marco Rondon, Senior Program Specialist, Climate Change and Water, IDRC. The panelists looked to CSA as an important opportunity for dialogue between parties who might not traditionally work together. A key message that became evident throughout discussions was the critical nature of NGO, public and private sector partnerships for effective integration of CSA in food security programming. Members highlighted the importance of collaboration between NGOs, government, academic institutions, and the private sector by recognizing the important contributions each makes to CSA. Discussions also focused on the continuum between CSA and agroecology, which considers interactions of biophysical, technical and socioeconomic components of farming systems. Other key topics included the importance of prioritizing farmer knowledge through consultation, and creating space for farmer-to-farmer knowledge exchange. By focusing on climate change, CSA encourages those working on improving agricultural systems to plan for future changes and build resiliency in the communities who depend upon it. CFTC looks forward to continuing to support C4D and its members in its critical work of helping vulnerable people emerge from poverty through climate change adaption.